I migrated from SharePoint 2010 to SharePoint 2016 and found that Content Query web part on the Home page does not display items. I have not changed any configurations after the migration. The Content Query web part is configured to display items from a generic list from a subsite in the site collection. This list has Audience targeting feature enabled. List schema and the permissions for the list is same in both the environments. The web part displays "Url" field as content. 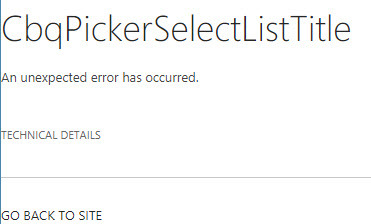 I also found that the list picker shows the below error while configuring the Content Query web part. User migration is also completed for this environment. Please let me know if anybody faced this issue or any ideas about the issue. I can suggest two things that you would need to check and confirm. 1) If the content query web part is referring to a script, check and correct the URL of the script, since you migrated the site, the URL's would be changed. 2) Within the content query web part check the referring link to the List and update the URL to point to the new address of the generic list. Not the answer you're looking for? Browse other questions tagged migration content-query-web-part audience-targeting or ask your own question. Can I use Content Query Web Parts in Foundation? Content By Query filtered by managed metadata, unfiltered view = all items?